This site is NOT owned or managed by the Utah State CERT Program, the Utah Department of Public Safety, or any other government agency or entity. This site is a voluntary and collaborative effort to coordinate CERT events and activities in Utah. Come join the fun at the largest Utah CERT event! 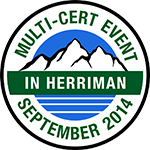 The Multi-CERT Event is an annual event planned and produced by multiple jurisdictions in the Salt Lake area that are committed to the CERT program and recognize value in multi-team collaboration and training.